multidimensional scaling, and tests if two colour-difference formulae are or are not statistically significantly different. The same index can be also used to compute intra- and inter-observer variability in visual experiments. 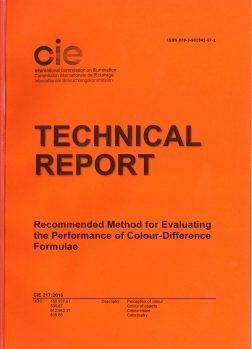 Beside important advances made in the field of colour-difference evaluation using reliable visual datasets currently available, the results achieved from the STRESS index indicate that it is not possible to recommend a more uniform colour space with a Euclidean colour-difference formula that is statistically significantly better than CIEDE2000. The publication is written in English, with a short summary in French and German. It consists of 28 pages with 1 figure and 11 tables and is readily available at the National Committees of the CIE or via the CIE Webshop. The price of this publication is EUR 72,- (Members of the National Committees of the CIE get 66,7 % discount).